WASHINGTON, DC, April 22, 2015 (ENS) – Climate change is the greatest threat that faces humans today, and as a nation, the United States must “act before it is too late,” declared President Barack Obama in his 2015 Earth Day Proclamation. “The United States is committed to our role as a global leader in the fight against climate change,” he proclaimed. Today, on Earth Day, the President visited Everglades National Park in Florida to speak about the threat that climate change poses to our economy and to the world. “We’re all here because this 1.5 million acres is unlike any place on Earth. It’s no wonder that over a million people visited last year alone. 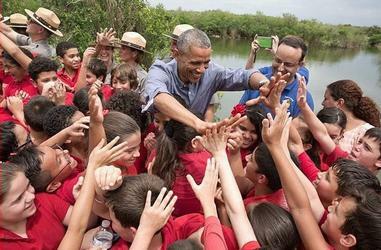 The sawgrass prairies and mangrove forests are home to an incredible diversity of wildlife – bald eagles, herons, hundreds of plant species, from pine trees to wild orchids,” said Obama. 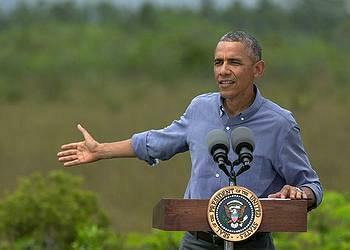 Obama announced several Earth Day actions to help preserve the Everglades. First, his administration released a report showing that every dollar invested in the National Park Service generates $10 for the economy. In 2014, almost 300 million visitors to our national parks spent almost $16 billion and supported 277,000 jobs, Obama told the crowd. “So protecting our parks is a smart thing to do for our economy. That’s why I’ve set aside more public lands and waters than any administration in history,” he said to applause. Here in the Everglades, we’ve already invested $2.2 billion in restoration efforts. 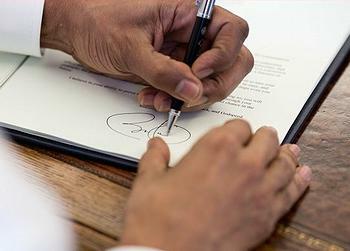 With the support of some outstanding members of Congress, I’ve proposed another $240 million this year,” he said. “We want to restore the natural water flow of the Everglades, which we know is one of the best defenses against climate change and rising sea levels. And I’m calling on Congress to fully fund the Land and Water Conservation Fund, which supports this work across the country,” the President said. Obama also announced $25 million in public and private money for restoration projects at U.S. national parks. And today, the President designated America’s newest national historic landmark, the Marjory Stoneman Douglas House in Miami, “so that future generations will know how this amazing woman helped conserve the Everglades for all of us,” he said. Marjory Stoneman Douglas (April 7, 1890 – May 14, 1998) was an American journalist, writer, feminist, and environmentalist known for her defense of the Everglades against plans to drain it and claim the land for development. Her most influential work was the 1947 book, “The Everglades: River of Grass,” which reshaped the general idea of the Everglades as a treasure instead of a worthless swamp. In his Earth Day Proclamation, President Obama first recounted the history of Earth Day, which celebrates its 45th anniversary today.